"The formula contains anti-ceullulite technology and has a gorgeous coconut/vanilla scent"
Hope you are all doing really well? The weather is so bad here in Wales, so I'm tucked up by the log fire getting my blog on! 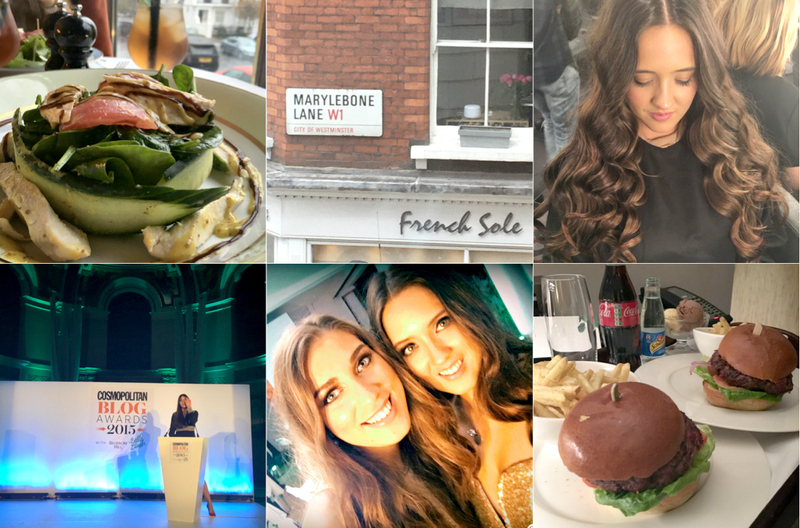 I'm really hoping to get back into the swing of things with my blog, as the past few weeks have been super crazy! Recently, I have been trying out the SiennaX Gradual Tan and I couldn’t wait to have a little chat on the blog about it and tell you my thoughts. I would love to hear from you in the comments section and don’t forget to use my social icons if you would like to get in contact with me a little quicker. I’ve tried a lot of tanning brands and to be honest I’ve really liked 90% of them. I was excited to try Sienna X, as I’ve heard quite a lot of good things about them. With the wintery weather upon us I find that sometimes a full on tan is a little hard to maintain, especially when you are naturally pale like myself. However, for me a slight glow can really transform how I feel about myself and give me the confidence to take on the day! I also feel like a touch of colour helps to make you look less tired, which is always a bonus for a bad sleeper like me - who is currently living off Black Coffee & Sugar in work. The Sienna X Gradual Glowing Self Tan is a rich and luxurious cruelty free moisturising cream with 4% DHA, which is perfect for gradually building up a sun-kissed glow or to simply prolong a tan you may already have! The lotion is rich in texture and contains Aloe Vera, known to soothe and soften skin along with sweet almond oil and cocoa butter to ensure that the skin is fully hydrated. Another key ingredient is ‘Butcher’s Broom’ it may sound a little scary, but it’s known to improve circulation and skin tone, whilst reducing swelling. The formula also contains anti-cellulite technology and a gorgeous coconut/vanilla scent, which is very dreamy without being overpowering. I can honestly say this is the FIRST tan that my boyfriend Daniel has actually approved of and hasn’t spent the whole night telling me off for one reason or another – Maybe, it’s the dreamy holiday scent? 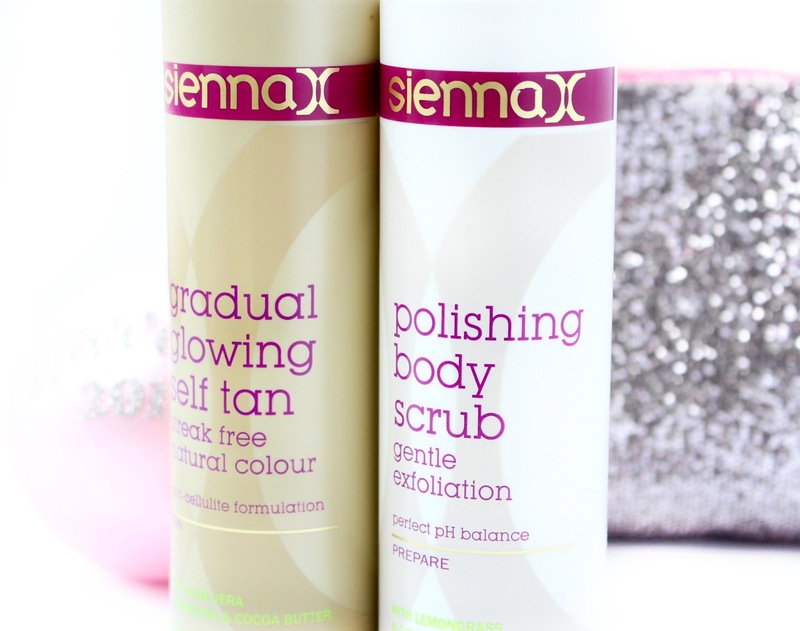 I must admit I love the Sienna X Gradual Tan for winter tanning! Its super nourishing, gives a great glow and it smells just like a far away holiday – It sure does vanish those winter blues. I’ve also been using the Polishing Scrub £9.96 along with the tanner, which helps to remove impurities without harshly exfoliating your skin. The Polishing Scrub contains lemongrass and ginger along with the finest pumice, which help to naturally soften and improve skin. I honestly think that this Sienna X duo is great way to achieve a natural looking glow, which isn’t always easy during the winter. I have had no streaking issues and every time I have used this product (roughly 2/3 times a week) I have been left super happy with the results. I do feel that the tanner could be a little rich for use in the spring/summer, but my thirsty winter skin can’t get enough of it right now. Overall, I’m really happy with both of these products and think they are the way forward if you’re looking for a subtle glow during the colder months. I would love to hear your thoughts in the comments section below - Have you tried Sienna X? Hope you're all doing well? I love a Sunday and always enjoy writing up a few posts and taking pictures for my lil old bloggy! I've wanted to post the past few days, but all the terrible events in Paris and around the world have left me feeling pretty numb and helpless. 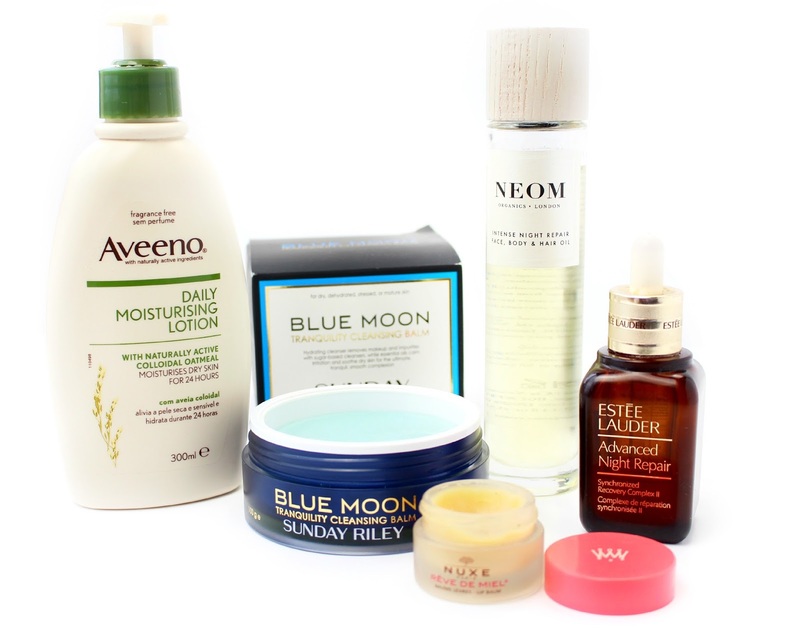 Now that winter is upon us I thought I would write a post on how to upgrade your winter skincare. I'm by no means a skincare expert, but I'm lucky to have had some skincare training from Elemis, which is the reason why I love chatting about skincare so much! We all have completely different skin and our skin types can change up to 9 times a day, so this is more of a guide on how you can inject a little more moisture into your skin during the winter. I hope you enjoy this post lovelies and I would love to hear from you in the comments section below! You can also use my social icons to the right hand side if you would like to get in contact a little quicker. I must admit I love a good cleansing balm regardless of the time of year, but they definitely come into their own during the winter months. 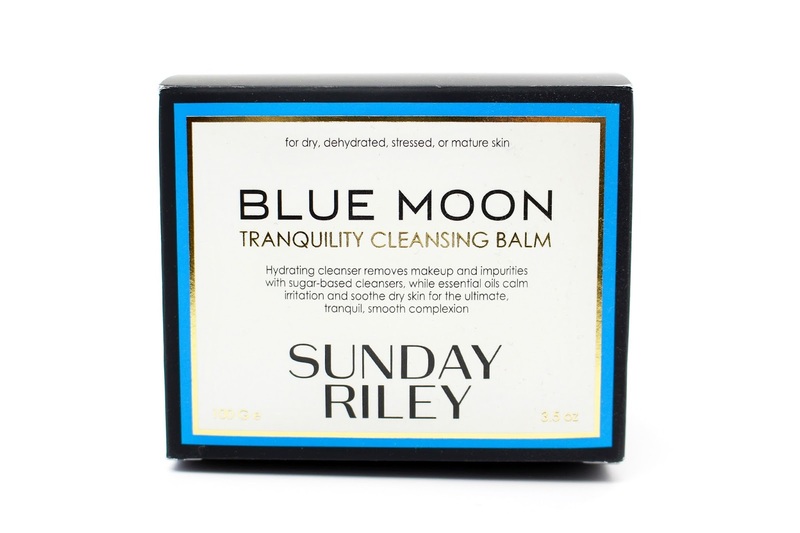 Cleansing Balms contain a high concentration of oils that help to dissolve makeup, dirt and excess sebum without drying the skin or stripping important natural oils from your skin and therefore make a fab addition to any winter skincare routine (plus the majority of them double up as a luxurious face mask) I'm currently using the Sunday Riley Blue Moon Tranquillity Cleansing Balm, but I also love and recommend the Emma Hardie Amazing Face Cleansing Balm & the Elemis Pro Collagen Cleansing Balm. Whether or not you already use a serum they make a great addition to a winter skincare routine! Due to their molecular structure (thinner consistency) they are able to penetrate the skin much quicker and deeper than a moisturiser, which tends to mainly target the top layers of your skin! Serum's are a much more concentrated and tend to deliver a lot more active ingredients to the deeper levels of your dermis - leaving you with hydrated, clearer and brighter looking skin. I absolutely love the Estee Lauder Advanced Night Repair II as it is fantastic to use morning, evening and also mixed with your foundation! This time last year my lips were dry, cracked and in terrible condition! I couldn't wear any of my nice lipsticks because of the condition of my lips, so this year I did my research to find a truly fantastic lip balm and I've fallen head of heels for the Nuxe Reve De Miel Balm, which is a fantastic way to cure chapped and uncomfortable lips! There are so many amazing body products out there, but sometimes having a staple fuss free body moisturiser in your winter routine is the way forward, especially in the colder months where your body can suffer from climate change. The Aveeno Daily Moisturising Lotion is my go to body moisturiser and I love that it's totally fuss free, no scent and really just concentrates on doing what it says on the bottle! Adding an oil into your skincare routine is a great way to not only moisturise your skin, but also to balance it. I'm currently using the NEOM Intense Night Repair Face, Body & Hair oil, which not only covers everything, but it also has fantastic therapeutic oils which make it the perfect relaxation treat! I hope you've enjoyed this post lovelies and I would love to know how you change your skincare for winter? I hope you’re all doing well and hopefully feeling nice and cosy inside, as it's pretty miserable weather wise at the moment! I've been itching to get this post written up and I do try to limit my visits to Space NK and Cult Beauty unless I’m feeling a little spendy, as I’m sure you all know they are just pure beauty temptation! 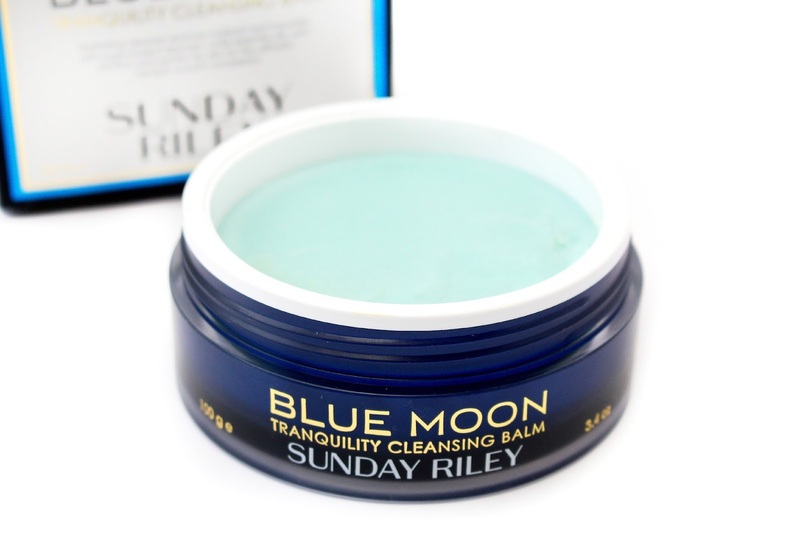 Recently, I decided to head over to Space NK and the first thing to hit me on the homepage was the ‘Sunday RileyBlue Moon Tranquillity Cleansing Balm’ Now I’ve never actually heard of Sunday Riley before and I was far more interested in it’s name ‘Blue Moon’ and the fact it was Blue… Yes Blue!! I followed through from the homepage and the next thing I was met with was it’s super pricey price tag £46 (Ouch). However, I just couldn’t leave this product alone and in true beauty blogger style I started my research and ended up crumbling and purchasing this absolutely stunning cleanser! – I’ve been super excited about this product and couldn’t wait to get my post up to tell you all about it. I’ve used this product for around two weeks, so this will be more of an initial thoughts post. I hope you enjoy this review lovelies and I would love to hear from you in the comments section below. You can also use my social media icons to the right hand side if you would like to get in contact with me a little quicker. Firstly… How beautiful is this cleanser? I’m a little star struck by it to be honest and of course it’s Blue which makes this cleanser even more beautiful and majestic. The packaging is also beautiful and even though it’s pretty simplistic, I love the contrast of the dark blue and gold writing. 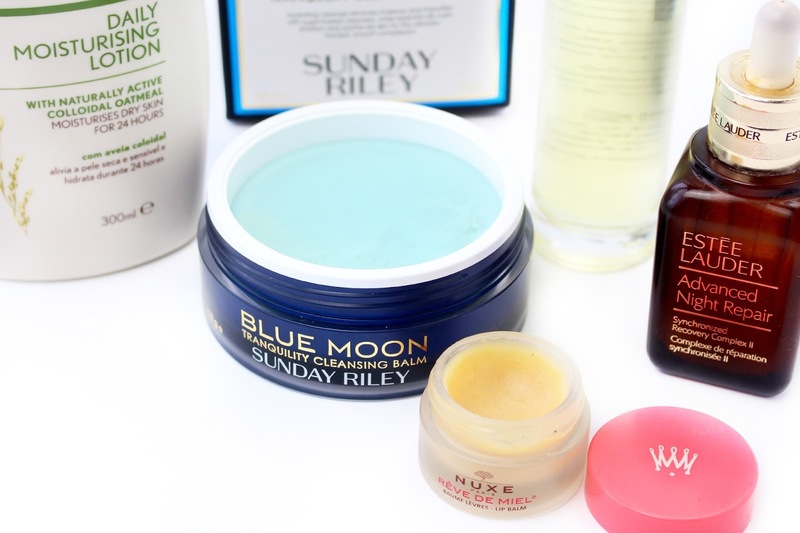 Sunday Riley are a brand that I'm not actually familiar with, so I wanted to find out a little more about them! Sunday Riley has cleverly harnessed her native, North American botanical to create a range of potent anti-ageing products. Her patented NV-5 Ageless Complex marries five traditional skincare ingredients with hi-tech processes, to maximise their reparative and skin brightening properties. Not only is Sunday Riley a high performance brand but the brand also has a celebrity fan base including, Cameron Diaz, Victoria Beckham and Gwyneth Paltrow! On opening the product you are greeted with a light aqua blue balm that smells faintly like Terry’s Chocolate Orange (Was not expecting that) but if you're a fan like myself then this will be like heaven. It's pretty hard in texture, but it soon melts into a luxurious balm that is very similar to the Emma Hardie Amazing Face Cleansing Balm. 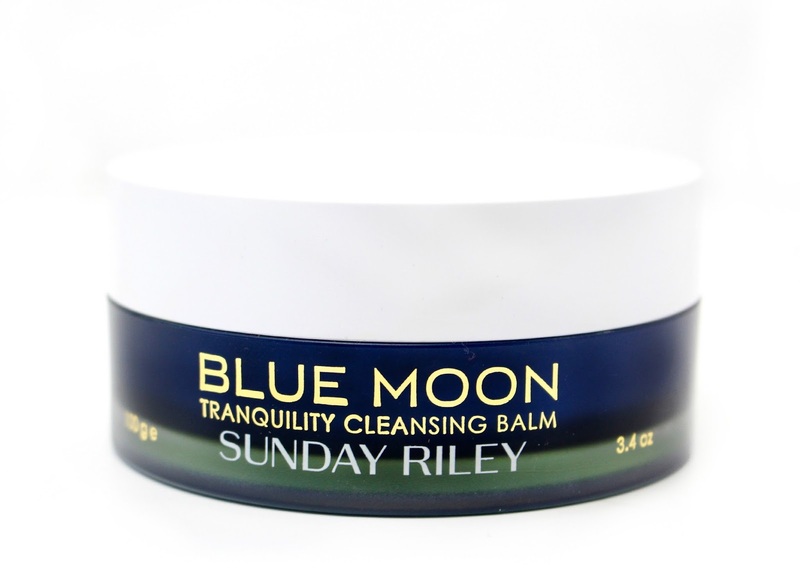 The Sunday Riley Blue Moon Tranquillity Cleansing Balm is described a luscious blue cleansing balm, which leaves skin thoroughly clean, comfortable, hydrated and glowing! Key ingredients include blue tansy, German chamomile and beeswax absolute to help calm irritated, dry, flay skin whilst clementine petigrain improves skin tone, texture and clarity. Cocoa butter, moringa butter, squalene and the addition of vanilla and tangerine create a truly luxurious cleansing experience that will restore the skins tranquilly. After using this cleansing balm for around two weeks it's safe to say I'm a huge fan! Everything from the name to the packaging and most importantly the product is simply fantastic. I tend to use this as an evening cleanser as I love indulging in the whole experience and the light lingering scent of chocolate orange. I've also been using this as a hydrating mask, which works so well to soften and nourish my skin. I would say its too early to really go into detail about results, as I will need to use it for around two months to really see how I'm getting along with it. However, so far so very good and I can see why it has such an amazing celebrity following! I hope you've enjoyed this review lovelies and I would love to hear from you in the comments section below - Have you heard of this brand and would you consider trying this product or would you like to see a comparison to the Emma Hardie Cleansing Balm? Hope you're all doing well? I recently attended a coping with pressure course and actually one of the key points was knowing when to treat yourself and I thought to myself yep, I’ve got that coping method down ha! So, today I decided to write about a gorgeous and pretty niche face mask I ‘Treated’ myself too last month from Cult Beauty. I’ve been using it once/twice a week and definitely feel like I’ve used it enough to give you all my two cents. I always head to Cult Beauty or Space NK when I fancy something a little different and slightly more exclusive. So without a second thought I headed to the Skincare Exclusive section on Cult Beauty and stumbled upon the ILCSI Apricot Gel Mask. I’m super excited to talk about this mask, so I hope you’re feeling super comfy and ready to find out about this delicious treat. ILCSI is a brand new to me and was developed by ‘Aunt ILCSI’ more than half a century ago, her family name is synonymous with the finest, supernatural Hungarian skin care. Good enough to eat, yet super effective, each batch is handmade to order and so fresh (to capture the potency of botanical actives) that her products need to be stored in the fridge after opening. 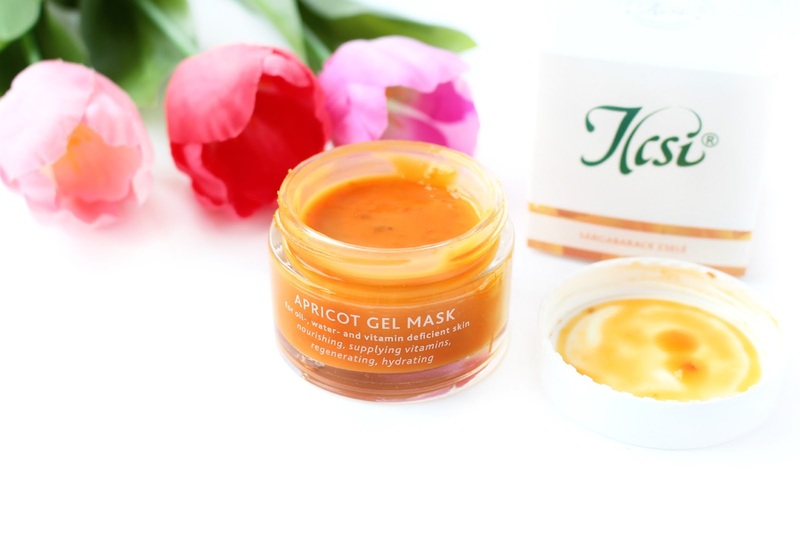 The ILCSI Apricot Gel Mask is described as an intensely hydrating and nourishing gel mask that is bursting with natural flavonoids. I chose this mask primarily for is restorative benefits, but kinda because it looked good enough to eat too! 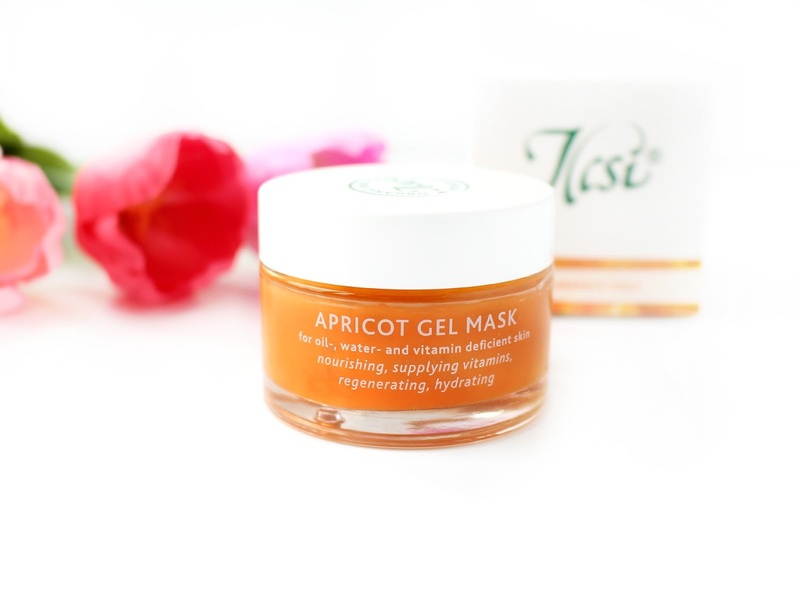 On opening the mask for the first time you are greeted with the most beautifully potent scent of Apricot and a gel like texture, which actually looks and feels a lot like Jam. The application is slightly messy, but fun because it does really feel like you’re putting jam on your face! The mask itself is full of natural fruit acids, which gently resurface the skin’s vitality and helps to replenish dry and vitamin deficient complexions. The star ingredient is of course Apricot which delivers exceptionally high flavonoid and vitamins, while Beta-Carotene helps enhance micro circulation, which feeds cells to enhance their ability to do what they’re supposed to! – I’ve found this mask fantastic for smoothing my skins surface and after applying a medium layer I’m also left with noticeably radiant skin. I’ve been using this mask 1-2 times a week as a treat and I just love it. I tend to suffer with dehydrated and dull looking skin and this mask which injects some much needed hydration into the skin. However, one thing to warn you about… this mask is not recommended for sensitive skin types, as it’s potent formula could potentially irritate very easily upset skin types. As I mentioned earlier, each batch is handmade to order and for me that is really special. A few years back I undertook a project where I was making hand-made lip balms and honestly it was the most rewarding experience ever, just knowing that so much of my hard work and dedication had gone into it. I love the fact that ILCSI are a family brand and that everything looks and feels good enough to eat – I get a real old school vibe where I can actually imagine Aunt ILCSI making her fabulous products in her kitchen. I always used to love picking herbs and flowers from the garden and making them into some sort of potion, so I personally find the production of her products amazing! I hope you've enjoyed this review lovelies and hopefully i've introduced you to something a little different? If you've tried this brand before I would love to know what you have tried! ?